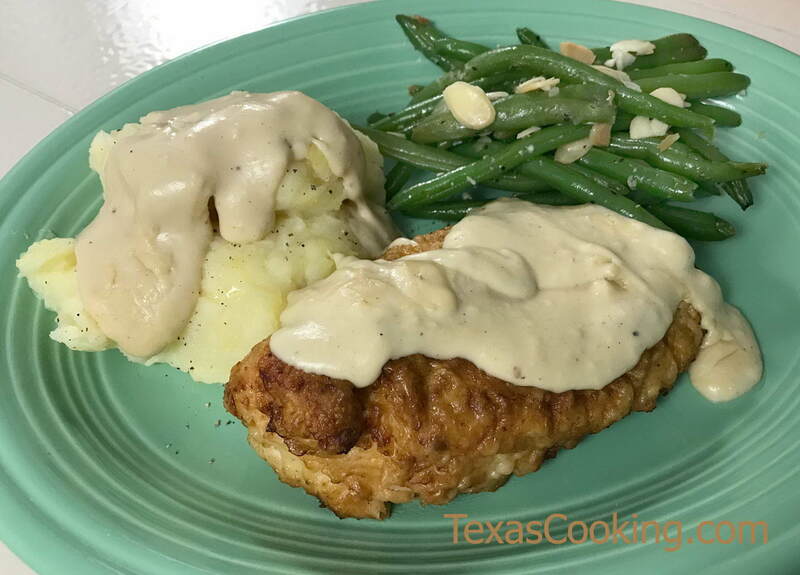 This is essentially Texas-style chicken fried steak made with chicken breasts instead of beef steak. Chicken Fried Chicken is wonderful served with mashed potatoes, steamed vegetables and lots of cream gravy. Beat together the egg and milk and pour into a pie pan or other flat pan; beat well; set aside. Mix together the salt, black pepper, paprika and white pepper and sprinkle on both sides of chicken breasts. Put the flour in a pie pan or other flat pan. Dredge the chicken breasts in the flour, shaking off the excess. Then dip each piece in the egg/milk mixture, then back in the flour. (You're going to get your hands messy here, so take your rings off.) Set chicken pieces aside on a piece of waxed paper. After the chicken is removed from the pan, pour off the pan drippings, reserving 2 tablespoons. Keep as many as possible of the browned bits in the pan. Return the reserved oil to the skillet, and heat oil over medium-high heat until hot. Sprinkle 3 tablespoons flour (use the left-over flour from the chicken fried chicken recipe) in the hot oil. Stir well with a wooden spoon, quickly, to brown the flour and form a roux. Gradually stir 1-½ cups milk into the roux, stirring constantly with the wooden spoon, mashing out any lumps, and bring to a boil. Continue stirring a few minutes as gravy thickens and reaches desired thickness. Check seasonings and add ground black pepper and salt to taste. Note to Cream Gravy novices: Gravy-making is an inexact science. Cream gravy is supposed to be thick, but if you think it's too thick, add more milk, a little at a time, until you're satisfied with it.